For quite some time now I have dreamt about building a proper wine cellar in my house. No.... not just an old wine box in the corner of my closet, but an actually real deal wine cellar with the proper insulation and wine racks needed to keep my wine in the perfect environment for pristine provenance. I have an amazing walk-in closet in my office that is chalk full of empty wine bottles, wooden wine boxes, and other miscellaneous junk that probably needs to find a new home at the dump! 1: Proper Insulation - If the space you're looking at for the cellar has a wall that is close to an outside wall and may be subject to heat, you may need to insulate with extra layers of insulation on the walls. 2: Proper Cooling System - Finding the appropriate sized cooling unit for the space is key in order to keep the temperature as stable as possible. Cooling systems come in all shapes and sizes but they are not air conditioners! Choosing a wine cellar cooling system is important because you'll need to monitor both the temperature and humidity for your cellar. 3: Proper lighting - Fine wine needs to be kept in a relatively dark place where dangerous UV's can't effect your wine negatively. I would suggest installing a very dim style of lighting. Not a big ol' bulb! 5: Proper Wine Racks - You'll want your wine held firm and in a secure laying down position. When your collection grows this will ultimately be an important organization tool as well. 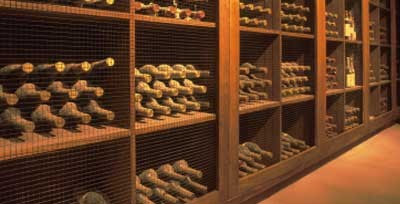 Having the proper racking is also key for creating an aesthetic appeal to your cellar. 6: Decor - This is an easy part because you can choose from all kinds of art, wine labels, and creative wine decorations. I suggest getting some really cool Bordeaux wine box planks off of your collector pals or from the wine shop! There may be a few things left to consider such as security, insurance, and perhaps software to catelog your wines..... but these things may not be of importance if your building a small cellar such as my own. There is an amazing website that I've come across that has lots of information about building your dream wine cellar as well as all the equipment and advice you'll need. Just visit the links in this post to find out more about "Vintage Cellars". Nice blog. Thanks for sharing the tips on building a proper wine cellar. It was nice going through your blog as it is informative and helpful. Love your ideas about the wine cellar except for tossing the wooden wine boxes out. Ill take them! Im guessing that you want to throw them out because they aren't in good shape or they have broken lids etc. Wine crates are perfect for storing wine and they have beautiful designs. Properly placed, they add a very unique and genuine flair to a wine cellar. There is a website: www.winepine.com that shows all kinds of wine box and wine panel projects. Let me know what you think!